Thursday January 30th - I'm currently excitedly planning a Summer trip to New York, Toronto, Chicago and Minneapolis (all recommendations welcome! ), but after yet another wonderful evening out in Brixton last night, I was left wondering whether anything across the pond could compare. Yesterday began as it so often does in Brixton, at Craft Beer Co for a couple of beers. I enjoyed a Thornbridge Sequoia & Evil Twin Nomad Wit, and Max started with a Thornbridge Chiron. 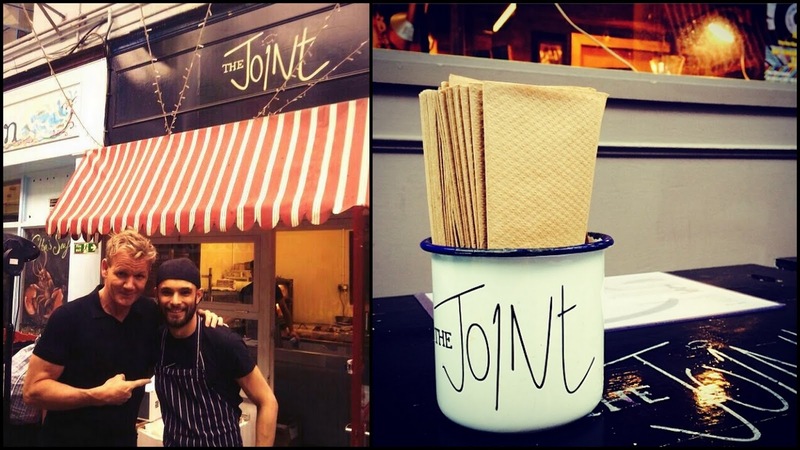 If you haven't made it to one of the Craft bars around London, put it on your to do list. There are quality drinks besides beer, but try a few samples of their 20+ taps and you might just be converted. Max always brings back fun gifts from his travels abroad, and he impressed both me and the Craft Beer Co staff by presenting me with a box of 3 bottled beers from the Shiga Kogen microbrewery which is situated in a Japanese ski resort - pretty niche. 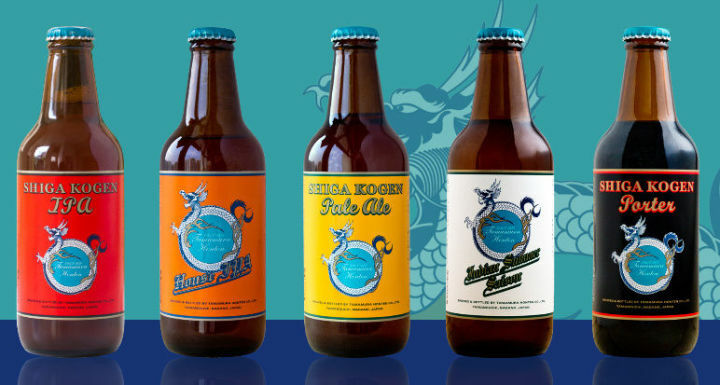 They are one of the few breweries in Japan to grow their own ingredients. Choosing where to eat in Brixton Village / Market Row is always difficult (for all the right reasons), so we took the advice of Burgaffair and Gordon Ramsay (see below) and sat ourselves down at The Joint. The menu is short and simple - a few sides (onion rings, riblets, sweetcorn, wings, hushpuppies etc), two types of slow-cooked pulled pork / shredded chicken in a bun/wrap and BBQ ribs. It's BYOB so pop round to Market Row Wines and pick up some cheap bottles of Brixton beer or refillable wine. 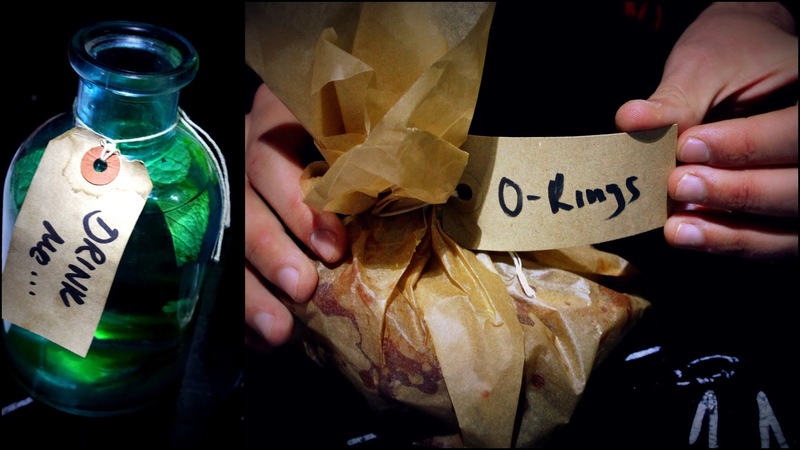 The sides are cutely presented in little bags with tags, and the Drink Me... mint-infused water is a nice touch. The onion rings were delicious - covered in a delicate batter and an indulgent BBQ sauce. To celebrate Chinese New Year, they are currently serving special pulled pork wontons with a BBQ sweet chilli jam dip - highly recommended. For mains, we both went for the Asian BBQ 16-hour pulled pork in a bun which comes with coleslaw, pickled ginger, chilli, spring onion and salad. Sounds pretty great, but lots of places are doing tasty pulled pork options, so The Joint have mixed things up by infusing a sourdough (not brioche!) bun with fig and giving it a vanilla glaze. A bonkers idea but they have pulled it off. It might be on the sweet side for some, but personally I was very taken with it. The initial sweet flavour quickly gives way to the pulled pork and chilli. The portions are enormous for £7 but I managed to polish it off pretty quickly. Beware - it is a fairly messy meal, but they do helpfully provide a mountain of napkins. Staff were very friendly, service was good, and the oddly appropriate chart music kept us from freezing on the outdoor tables. No trip to Brixton is complete without a £5 cocktail from Seven. I have already mentioned them twice on The List, so I'll go one better this time and mention them twice in one post! Not only are the drinks an absolute bargain, the bar itself is stunning. Even the corridor has been transformed into a beautiful, candlelit hallway, with foldable chairs efficiently hanging off hooks on the walls. We stopped here for a Honey Chilli Margarita and a Ginger Beer Basil Mojito before moving on elsewhere, but we did return later on! Max and I were joined by local Luke and flatmate Maggie (3rd & 7th on Team List respectively) in Sean's Bar, a cosy watering hole which pops up at night in the popular Rosie's Deli Cafe, round the corner from Seven. The drinks are simple but well executed by the eponymous Sean and his team, all to a banging soul soundtrack, every Thursday-Saturday 6-11pm. 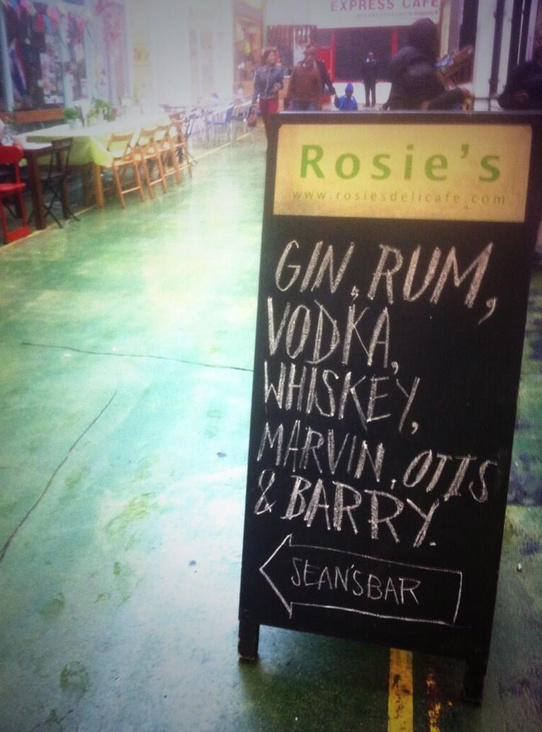 UPDATE: Sean's Bar has moved out of Rosie's Deli Cafe. Rosie is running a similar bar in the evenings currently. Sean runs Sean's Thai Bar in Balham and is looking for a new space in Brixton. There are only a few tables so it can be very busy, but it can also empty very quickly. It doesn't really matter as the atmosphere is great however full it is. Sean & co are a friendly bunch and keep themselves amused choosing the next tune. We had a serious Barry White session yesterday, which I continued with at home. A friend texted me this morning saying that Spotify had notified him that "Matt has been listening to a lot of Barry White". I recommend starting with Sha La La Means I Love You - off you go. I stuck to £4 G&Ts whilst Maggie went for an Old Fashioned from the £6 cocktail list. They are mostly classics (Negroni, Sours etc) but they do a couple of specials - Quince Tom Collins was on offer yesterday. Local Brixton beers are also available for £4. There are also several tempting food offerings including "Rosie's" Reuben Sandwich and Truffled Macaroni Cheese. Maggie's Roast Pumpkin, Prosciutto and Walnuts was beautifully presented and disappeared quickly. We could have stayed all night, and perhaps another time we will (late night lock in with Sean & Barry? ), but we decided to pop back to Seven for one more as Maggie had never been and we were so close! Sean's Bar is a wonderful addition to Market Row - go and check it out! Back at Seven, we returned to our corridor and I decided to splash out and go for the £7 Smoked Ale Old Fashioned - Walnut Bitters, Wild Turkey Honey, Buffalo Trace Bourbon and London Pride Ale - aged in Buffalo Trace Barrels and Smoked with Wood Chip Smoke. We joked that for a hefty £2 more we expected the full barrel experience, but they went one better and brought it in a skull shaped bottle filled with wood chip smoke. 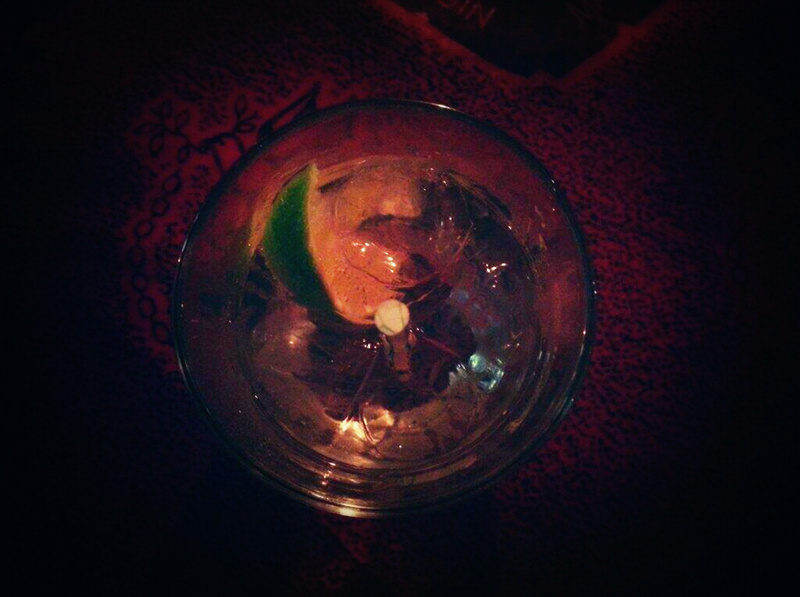 The drink was part shisha, part old fashioned and the smoke-filled bottle went round the table several times. Go and order one whilst they still have it on the menu, they change it quite often! It's worth noting that Seven have one of the few toilets in Market Row - Wishbone opposite also have one. Also, Sunday nights upstairs at Seven are currently the home to Sunday Skool, an evening of wine tasting and tapas run by A Grape Night In aka Laura & Kiki - two wine lovers who were responsible for several exciting popups last year. We are one of the best view bar compare to others in London. Grab a drink, take a seat, and enjoy the bar with a view London.